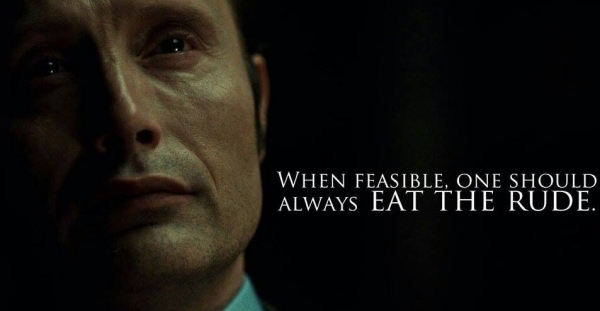 Hannibal Duress, Or: Words to the Not So Wise | "DESTROY ALL FANBOYS!" Feh. Even more than usual these days it seems the internet can be chock full of not too bright people who should be ignored at all cost. No matter how patient you are, some of these people want nothing more to drain your sanity with inanity while laughing at your heroically feeble attempts at civility. Having an “opinion” biased to the point of making you a total idiot who doesn’t know what you’re talking about and being loud and persistent about it because that’s how you “win” every time isn’t anything to be smug about. All that does is leave you with online “friends” who think like you, like what you say and will prop your soapbox up only until someone louder and more annoying comes along to kick you off that box and take over your airtime. That said, I’ll shut up now and let those of you who groove on tooting your own horn about things known little about continue to do your stuff. Have at it. Ignorance is bliss only up until you wish you knew what the hell you were talking about in the first place once you get into actual trouble because your one-way thinking has backed you into a corner with the dogs you’ve helped breed coming for you. This entry was posted in 2016, Commentary, DAF, Humor, Updates and tagged I Need a Vacation!, Insanity Clause, People Ain't No Good!, Stupid Is As Stupid Does, The Internet by geelw. Bookmark the permalink.